Does anyone remember this series of light gun toys made by Mattel for the TV series Captain Power? Well here I was sitting minding my own business during lunch when for no reason at all, I started remembering what toys I had when I was a kid. I wanted to tweet about it, but thought that perhaps a blog post is more fitting for such a great toy. You kids don't know what you are missing. I remember me and my younger brother getting this from a toy store in the big city when we were seven or eight. The game is played on a TV and your controller is the PowerJet XT-7 - yes, the motherfucking jets from the TV series. These light gun games were the early pioneers to more sophisticated light guns controllers like the Nintendo Zapper and eventually, boring video game controllers like the Wii, Kinect, Move and whatever. The PowerJet toys comes with several VHS that you play on a TV. Each tape contains two scenes of live action sequences (hmm, Jessica Steen) spliced with animated missions (it was like Wing Commander - which came after it, but even more awesome). You play by holding each controller jet and firing at pink targets on the TV. Occasionally enemies will fire back in the form of epileptic bright yellow flashes, in which case you retract your ship to avoid being 'shot at'. Some people cheat by covering the sensors, but we did not (or weren't clever enough to exploit the loop hole, I can't remember). The controller jets actually keep the score of targets you shoot down. Get shot too many times and the cockpit ejects! How awesome was that? 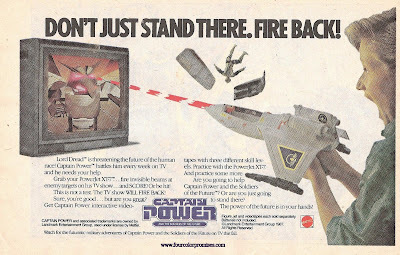 But what actually made Captain Power so much more awesome than your average light gun game was how interactive it was, if you had more than one controller jet. Your entire surrounding immediately becomes part of your game. Both me and my brother had the PowerJet XT-7 (white jet) and the enemy Phantom Striker (black jet), which we tend to blast around running around the house and shooting each other. It was pretty intense. We also had the Interlocker which was also interactive, and the none-interactive Trans-Field Communication Station. Those were the good times of interactive gaming. I am a video games person, but if there is anything I would do, I would do it to have another go at these classic toys. I hope my parents haven't threw them away or else it is time for me to hit eBay for some vintage Captain Power goodness.